Good news for HTC One buyers as the manufacturer has opened up a special promotion offering a $25 Google Play credit with the purchase of any One device between now and July 15th. The process of claiming the credit is very simple, just buy the device prior to July 15th, register your device and then redeem your offer at Google Play once you receive the promo code. The offer is good for any purchases made between June 14th and July 15th with Google Play credits redeemable up to November 30th of this year. Purchase registration happens at www.htc.com/us/googleplay/redeem and is limited to one registration per account. Codes will be delivered via email within 72 hours of registration. 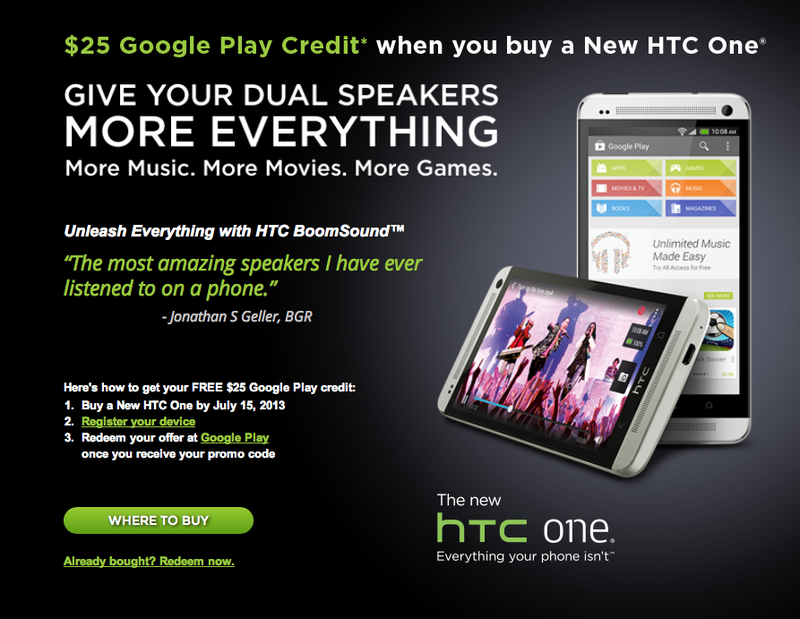 That sounds like a pretty decent offer for anyone purchasing the HTC One, I mean who wants to pass up $25 worth of free Google Play credits? ← Rumor Alert: HTC One Mini Headed For T-Mobile Store Shelves? That’s funny! Thanks for the laugh today. Not so sure that I agree with that. Every One buyer for the next month gets $25 to use in the Play Store. Awesome. 1 million S3, Note 2, & S4 owners get a chance to download the new Jay-Z album for free. Let’s do the math on that. There are 70 million+ S3 owners, 20 million+ Note 2 owners, & 15 million+ S4 owners out there. Considering the overages, there probably at least 110 million owners spread out over all three devices out there. Even if this promotion is only limited to certain territories, the chance of being one of the first million doesn’t sound that great. And that’s if you even care about this album. Everyone can use Play Store credits. Not everyone gives a sh*t about Jay-Z, in which case, this contest means nothing to you. Sorry for making you do all of that math cuz I didn’t clearly state my point. My point was that although a $25 credit is worth more than a $12 album, in terms of marketing, the album offer will have a better impact. 1. Many blogs and media outlets will cover the Jay-Z offer before they mention the HTC offer due to his celebrity status. Believe me. I completely understood the point you were making & I agree. I was just talking in terms of practicality for the consumer. Besides, there’s no need for apologies. Math is something I enjoy very much & adding 3 figures definitely isn’t what I would call very much of it. Cool, been thinking bout buying one. I got my email today also!